Shady Beaches is a great ocean front vacation rental in Kure Beach with 5 bedrooms, 3 full bathroom, one 1/2 bathroom. This home was completely renovated this spring and looks amazing! This home includes an extra enclosed outdoor shower with hot and cold water, oceanfront deck, and a balcony off the master bedroom with incredible views. The 5th bedroom is an efficiency apartment with a full bath and kitchenette. This apartment also offers a second living room, great for teens or mulitple families! The efficiency cannot be accessed through the interior of the home. 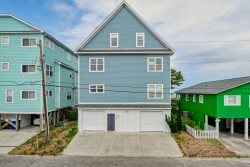 This is 1/2 of a duplex so there is only one shared wall and the private walk way to the beach is only shared with the other side of the duplex. There is parking for 3 cars onsite with extra free parking on the street, free WiFi, and a 55 inch smart TV in the living room. Kure beach is a nice, family oriented, quiet beach. This home is located only 3 blocks from the Kure Beach pier, several restaurants, and a few shops / attractions. The NC Aquarium and historic Fort Fisher are only 5 minutes away. Plan your beach vacation today! Ocean front deck and balcony and shared walkway to the beach. Please note that the 5th bedroom and a full bathroom is an efficiency apartment below that cannot be accessed through the interior of the home but is included in the rental rate.